Below is part 2 of our Getting Started Series and covers where to find information and resources for your hosting services. 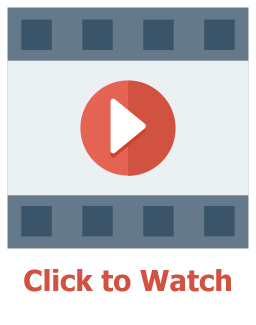 The video below is part 1 of our Getting Stared series and covers getting started with the AcuGIS portal and creating support tickets. To add layers from your PostGIS database(s) to your QGIS Desktop, follow below. 2. 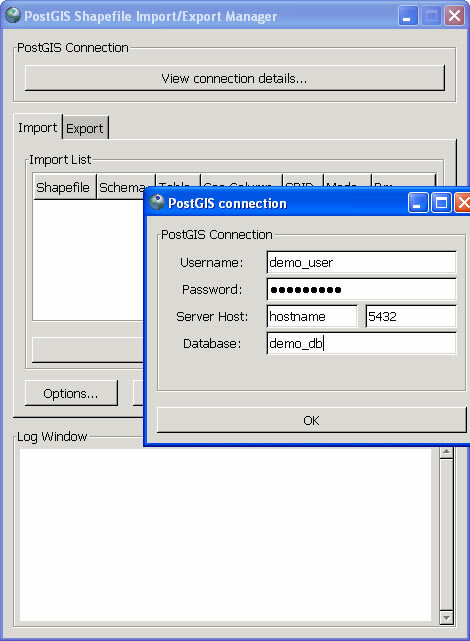 Click on “New” to open the “Create a New PostGIS connection” box as shown below. Enter your domain, user name and password as shown (substituting your own domain, user name, and password). Click Test Connection to verify. Then click Save. 3. Select the new connection you just created and click “Connect”. A list of your database tables will be displayed as show below. Select the desired layer as shown below. 4. As you can see below, the PostGIS layer ‘states’ we selected above has now been added. The connection appears in the Browser Panel and the ‘states’ layer appears in the Layers Panel. The layer is also rendered on the main canvas and ready for styling! If you have any questions or require assistance, simply raise a support ticket and we are here to assist. 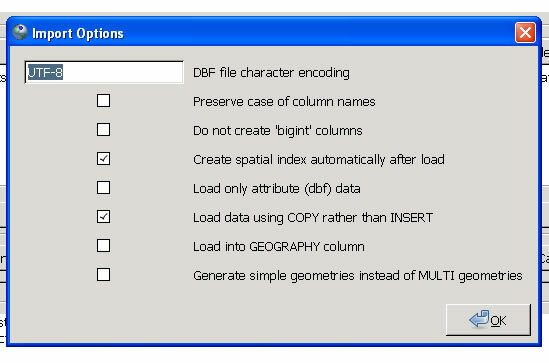 This post will cover loading shp files to your PostGIS database. We’ll look at loading files via our shp2pgsql GUI in your control panel, as well as via command line (SSH) and via your desktop. 2. Install PostGIS extensions into the database we created. (Video tutorials courtesy of our brainfurnace.com site). 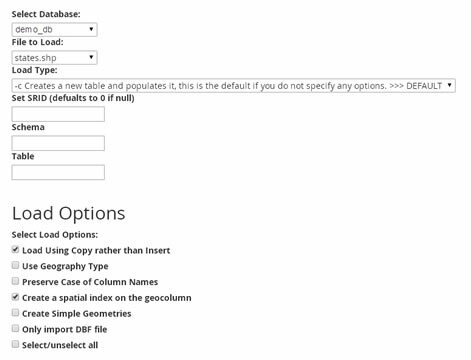 With our PostGIS database, we’ll load the ESRI file using the shp2pgsql tool in your control panel. 3. Select the database and select states.shp from the “File to Load” dropdown. Using the defaults, which is fine for most cases, a new table called ‘states’ will be created with a GEOM column. Optionally, you can set the table name to something else, set the SRID, append to an existing table, and specify the schema. Loading via Command Line (SSH). You can also load your shp files via the command line. 1. 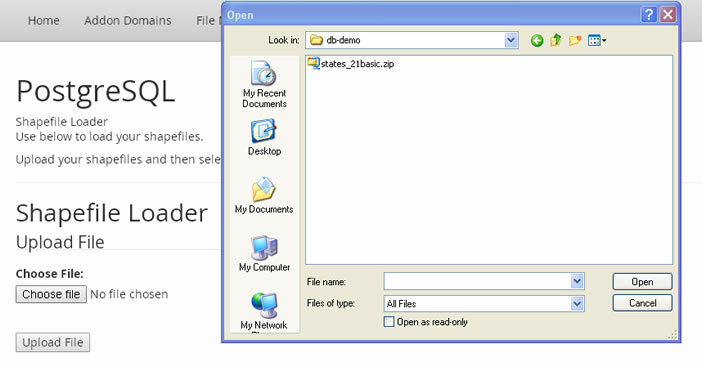 Start and SSH session and upload the zip file (or download it using wget). 4. Issue ls to check all of the file are present. 6. Click the Open button and then click on Import. NOTE: In all the above cases, we did not set a SRID. For our demonstrations with the states_basic21 file, this will not be an issue. In other instances, it will be required. We will look at setting the SRID, as well as updating it, in subsequent installments. If you have any questions or require assistance, please create a support ticket. If you have any questions or require assistance, please raise a support ticket and we are here to assist. This video will show you how to install our Omeka Leaflet Plugin.